The marriage dinner is a blessing, a reward, to believers who have lived faithful to the Lord. It is a foretaste of the eternal blessings of New Jerusalem. These believers have been and will continue to rejoice and exult and give the glory to the Lamb. The parable in Matthew 25:1-13 speaks about the faithful believers participating in the marriage dinner. “The bridegroom [a picture of Jesus Christ] came; and those who were ready went in with him to the wedding feast” (v. 10). Five others, who were unprepared, did not get into the feast. Many would say that those who were unprepared were not believers, they were unsaved. Actually, they are saved believers.They are spiritual “virgins,” which unsaved people are not. Their lamps were lit, although “going out.” These lit lamps typify their human spirit, regenerated by the divine Spirit. “The spirit of man is the lamp of Jehovah” (Prov. 20:27). They have oil, portraying the Spirit, in their lamps, but did not take extra oil in their vessels. 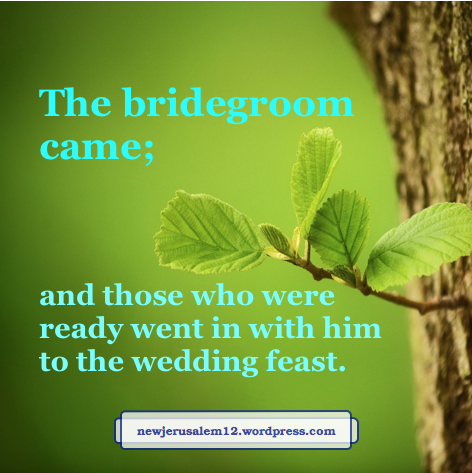 These unprepared believers during their lifetime “went forth to meet the bridegroom.” All, prepared and unprepared, arose at the cry, “Behold, the bridegroom! Go forth to meet him!” In contrast, John 5:29 shows us there will be two different resurrections for the dead, one for believers and one for unbelievers. When the Lord says to the unprepared, “I do not know you” it means I do not approve you, as in Matthew 7:23. The next post considers these unprepared believers regarding New Jerusalem.